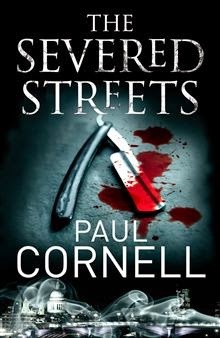 At Sci-Fi Bulletin; it's mostly about his new book, "The Severed Streets" (beware spoilers), but there were a couple of lines about his old Doctor Who books, so here they are. Talking of which… the Doctor Who New Adventures will be a quarter of a century old soon. Do you ever go and look back at those early stories? The DNA of the new series gets created there and I think you could list over a hundred specific points. I’m very proud of that but I’m very afraid of sitting on one’s laurels. Got to keep moving. I’m very much looking forward to being Terrance Dicks one day, if I’ve been a very good boy, and be able to sit back and go, ‘I did all that – isn’t that great?’ (Not that I’m comparing myself to Terrance!) I’ve been doing a lot of reading about classic Doctor Who recently, and he was absolutely that in his time: he just kept moving.